So, here we are in grips of a proper winter again; by proper, I mean one involving noticeable amounts of snow. 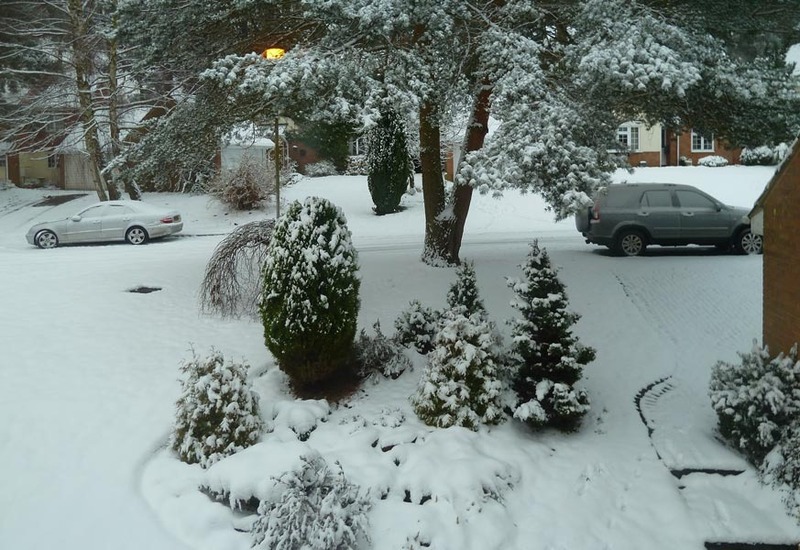 We have now been in our current house for 25 years and, for the great majority of those winters, we had very little or no snow. The last three winters, though, have been a very different story. We’ve had significant snowfall in all three. Prompted by the country currently being disrupted by the inconvenient white stuff and having last week screened their now annual Winterwatch live nature extravaganzas, our good ol’ BBC took the opportunity for a bit of cheap telly by digging into their archives and screening an old black and white programme on the devastating winter of 1963 in the guise of a Winterwatch special: Winterwatch, 1963 – The Big Freeze. 1963 was the most severe winter of the 20th century. What a trip down memory lane that programme was – I loved it. I was 10 at the time and I have vivid memories of struggling back with my mother, on foot, from the town hospital where we had been to visit my father. The snow came down and we slipped and tottered our way to the train station where we joined a lengthy queue. Finally we managed to get a taxi which slithered and skidded us the three miles home in awful driving conditions. Firstly I loved it because my memory did not extending to the severity and duration of the conditions we endured, and the old black and white programme demonstrated it admirably. I’ve never particularly enjoyed snow, other than a few skiing trips, but perhaps as a youth it might have been more fun than it was for my poor mother who had to do her best to keep me fed, with shopping excursions being difficult, and reasonably warm, before the days of modern conveniences like central heating. I think the thing I loved about it most, though, was the delight of hearing good BBC English once again. There was the charming Cliff Michelmore, along with Kenneth Allsop, both speaking clearly and with grammatical precision, in the way that the BBC used to do. I am only too keenly aware of the way in which language standards have dropped, even at the BBC, but I didn’t realize just how much they’ve plummeted in 50 years. This blast from the past was music to my ears and made me distressingly sentimental. Cheap TV it may have been but the BBC did put some extra value into this latest broadcast by adding an assessment of the effect that the 2-month long spell of arctic conditions had on our wildlife – an aspect that was missed from the original 1963 programme. I’m sure that indicates a very welcome, generally increased interest in wildlife throughout much of our society. I was staggered to hear it estimated that 50% of our birds died that winter. 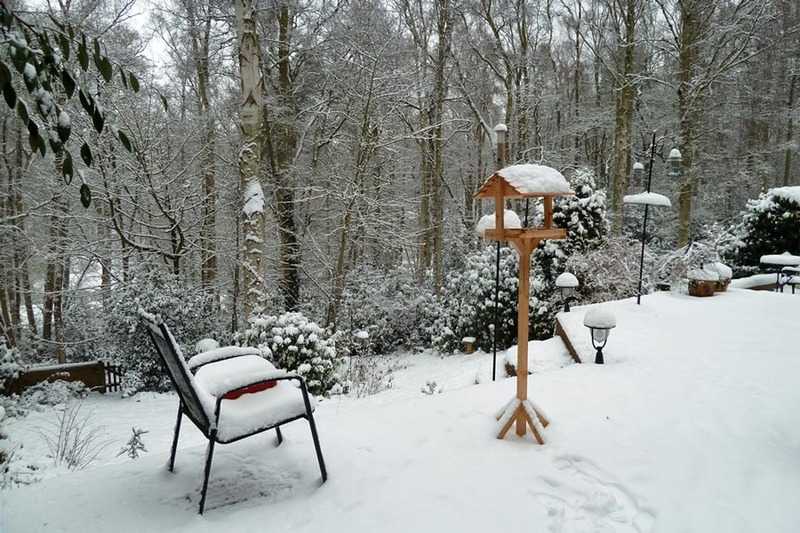 That adds weight to the need for us to do our bit by putting out plenty of food to help birds through this current spell of snow. There are few highpoints to any winter, in my view. To a small extent, I even used to think of skiing as making the best of a bad job, though, I must say, the Austrian Alps blanketed in crisp, fresh snow is an awe-inspiring sight and there’s no better way of seeing it. The only real benefit I see now (that we don’t ski) is that we do get visited by some interesting migrant species of bird. We are lucky enough to have some of them turn up in our own back garden. We’ve become used to winter visits by Redwings (Turdus iliacus) and Eurasian Siskins (Carduelis spinus) in most years. 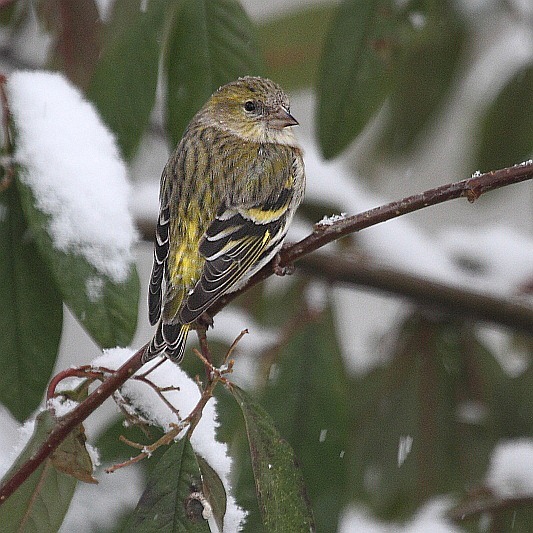 This year, I managed to snag a much longed-for Siskin shot without a bird feeder propping it up. Hoorah! Last year we were thrilled when our red berries attracted a passing flock of Bohemian Waxwings (Bombycilla garrulus) and, a couple of years ago, a single Brambling (Fringilla montifringilla) turned up. 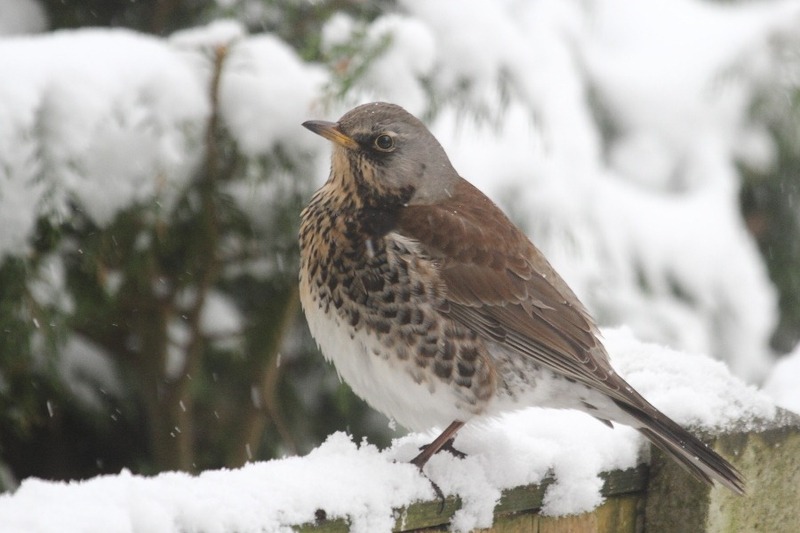 Yesterday, though, there was a considerable amount of dashing about the house caused by the arrival in our garden, for the first time ever witnessed by us, of a Fieldfare (Turdus pilaris). Actually, there were two, I think, and I spotted two flitting about again this morning. They supposedly love apples so I may have to put one out as bait. I’ve seen them before on just a few occasions but certainly never snapped one. So, although this shot includes our fence together with a rather unattractive concrete fence post, I was very happy to have it to add to our catalogue. Nice one! Let’s hope this lot doesn’t continue for as long as it did in 1963. Lots of snow again this morning. Love the bird pix. What I remember of the 1963 snow is that our school was shut for a week but I was off sick anyway with bronchitis so was done out of a ‘free’ holiday. Today my first thought is the wild critters. Just off to put out a load of fat balls.